Before I start my update for the week I want to let you know who our contractor is as I have had lots of questions and queries. 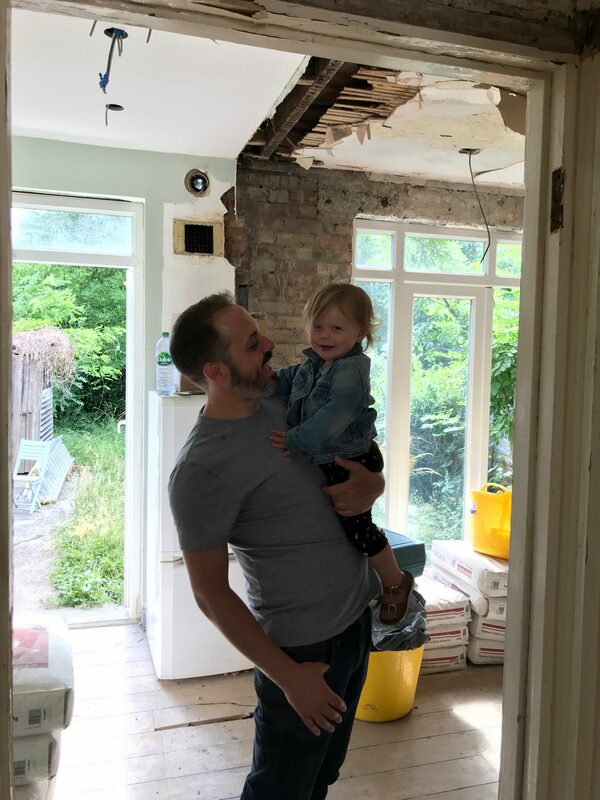 We were recommended James who runs JA Whitney Building Contractors by the lovely Becki who lives nearby and whose husband is a structural engineer and has worked with James. 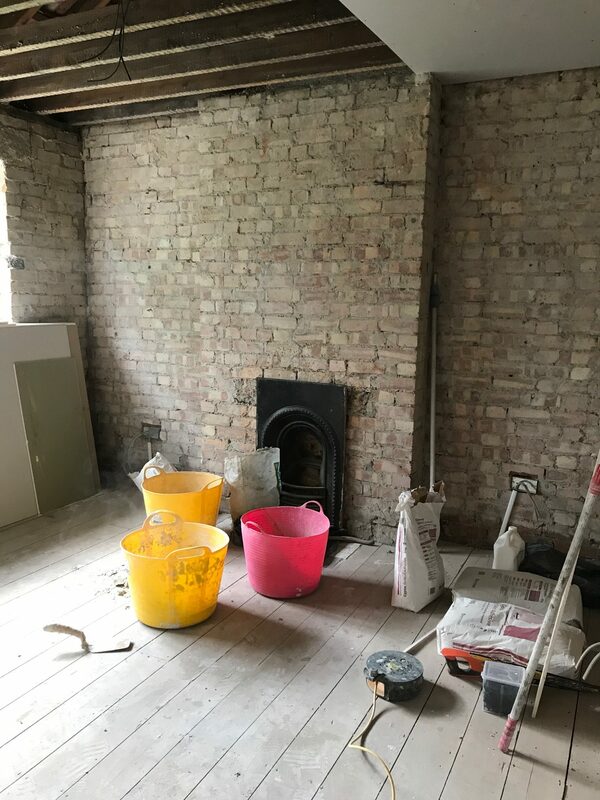 We were looking for a contractor who would coordinate all of the different trades and plan the schedule of works so that we only had one point of contact and no extra hassle or stress in dealing with several different tradespeople. Maybe a bit further down the line I can write a whole post about how it all works out but so far it has been so easy and simple. James visited the site several times before he began, produced a detailed quote breaking down each job and its cost, a detailed weekly schedule of works so that we know what is happening and when, a weekly invoice for the works completed the week before and all we have had to do is choose and buy the radiators, paint, bathroom suite and tiles – he buys all the necessary materials and they are included in the quote. Jules meets James every Monday morning before work to go through how the previous week went and any details that need to be discussed for the upcoming week. 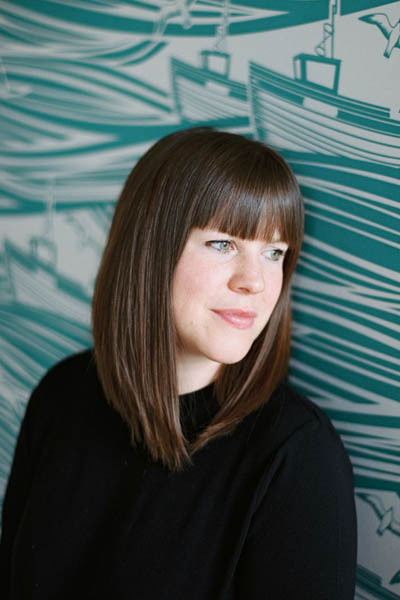 James’s partner, Sian, is on hand via email to do all the admin behind the project – invoices, building controls and that sort of thing – and answer any questions. The team have been great so far so I’m keeping my fingers crossed that that continues! This photo shows the whole width of the house, which is now open at the back of the house and opens up into the garden (or jungle as it is at the moment). In a couple of years when we have saved up enough we will eventually remove this whole back wall and extend into the garden but until then I’m pleased with house much difference the walls being removed has made. 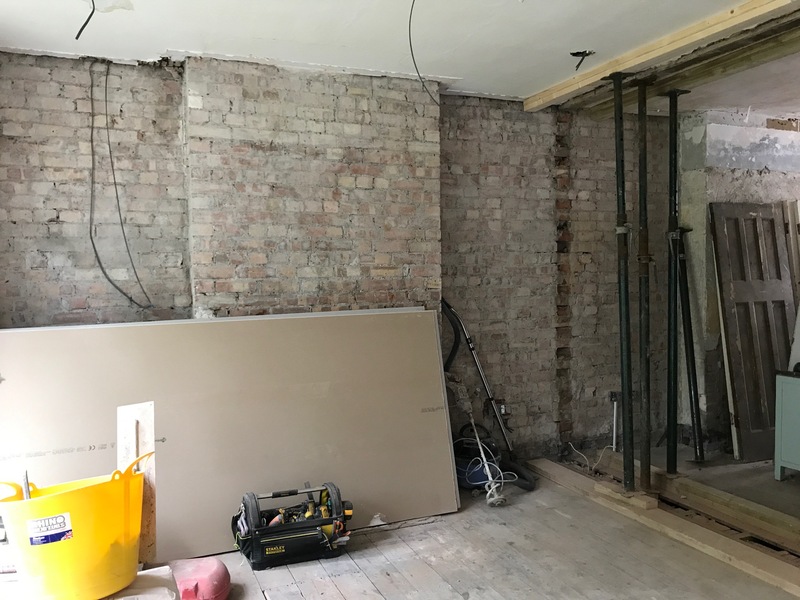 We have kept the hallway wall and removed the wall between the two receptions and the kitchen so that whole space is now open plan. We will also block up the doorway to the back reception but keep the two other doors so there are two points of access to the space. The remaining kitchen is behind the big sheets of plastic – really not much to see! 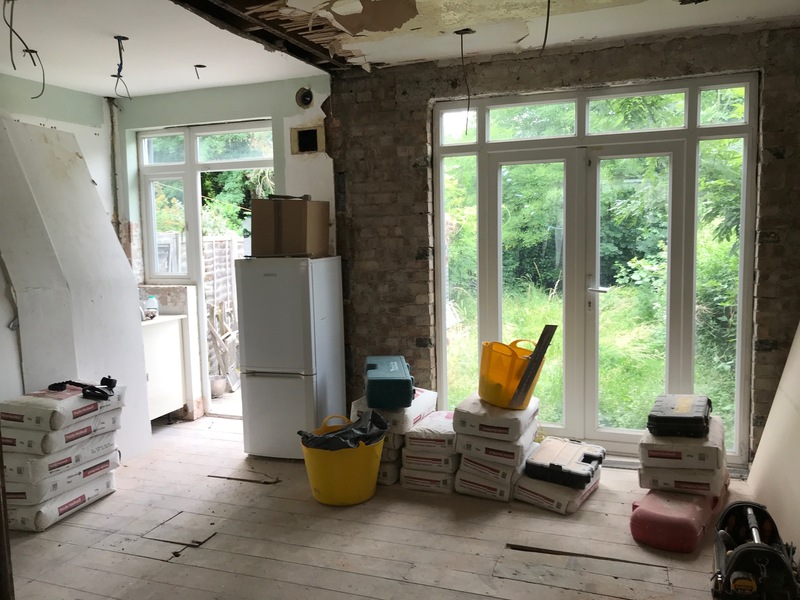 Our kitchen – ha! We have plans to do a DIY job on making this liveable. We have ordered a new inexpensive white laminate worktop from ManoMano because the black has got to go! The space is 2.7m so we will take the worktop to the end of the wall. My mum has an old ceramic sink in her garden and if we can clean it up well enough we will put that in too. I say ‘we’ but I actually mean Jules. 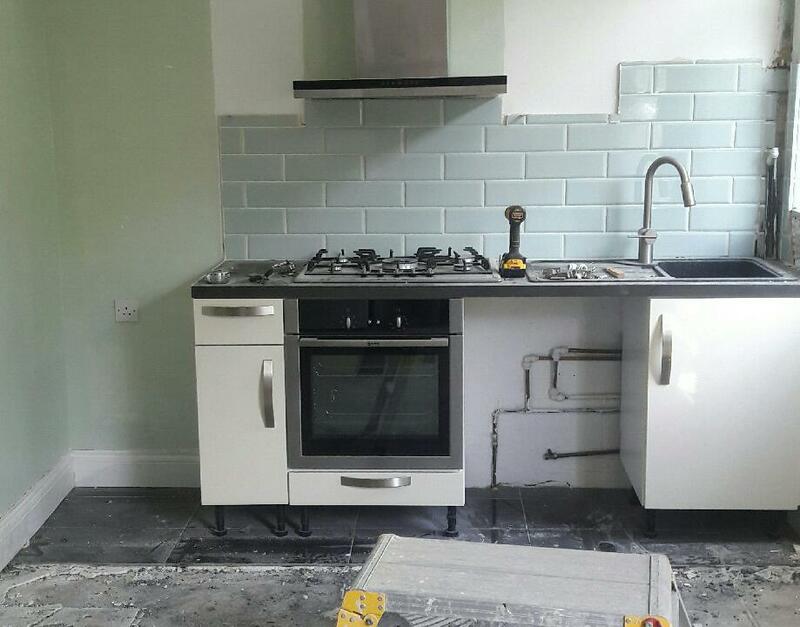 We’ll figure out an inexpensive way of replacing the cabinet doors, the tiles have already been removed and I think we may put my String Shelving up either side of the cooker hood for now. 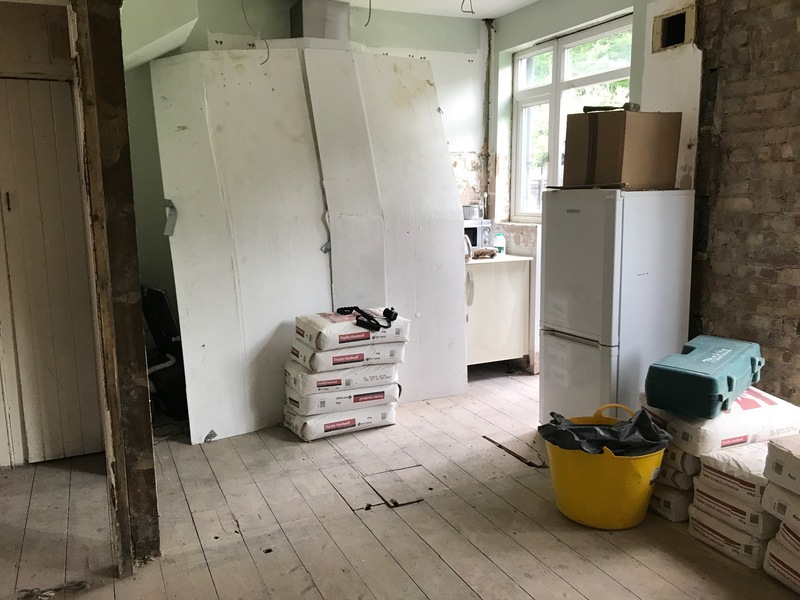 There is a separate larder in the hallway just next to the kitchen door and James, our contractor, suggested we place an under counter fridge and freezer parallel with this wall with a wooden worktop – probably one of those cheap Ikea ones. I think that’s a really good idea as it will give us much needed worktop space as well as giving us somewhere to discreetly hide away fridge/freezer as the space is too small for a big one. I’ll keep you updated on this separate project for us! 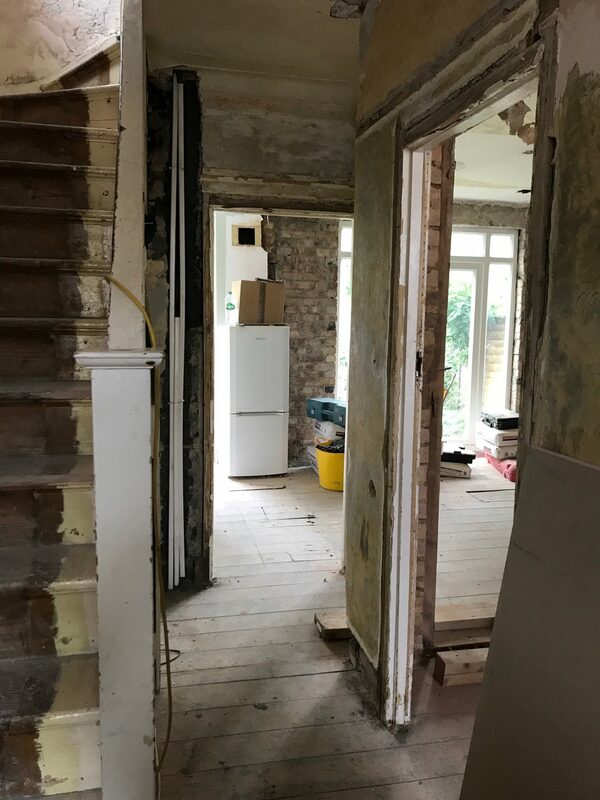 This is looking from the kitchen area into the dining room and you can see where the wall between the two receptions has been removed. This is looking in to the front reception from the french doors in the dining area. Hopefully once all that stuff has been moved it will be easier to visualise the space. Looking from the front reception down towards the garden. The front bedroom which will be our room. Mimi’s room. I bought this fireplace insert and just seeing that fitted makes it look like a proper room again. 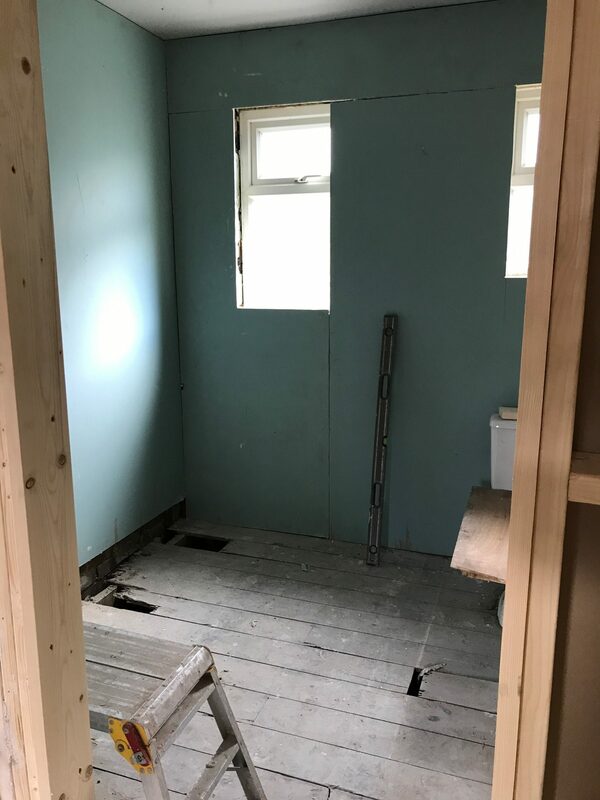 I’ve got loads more to show you about the bathroom as this is where we are spending a fair bit as we know it will always stay as it is. That will be my next post! I will soon be renovating the apartment, I can already see how the whole house will be a mess for a month … I hope that everything will go my way and we will not have to correct anything: D To be honest I do not like renovating, but I like to admire the final effect : D I’m also waiting for the post how everything will look like at the end of you. Hi Katy, I love what you’re doing with your house. Do you mind advising why you took down the old plaster and got the whole place re-plastered? 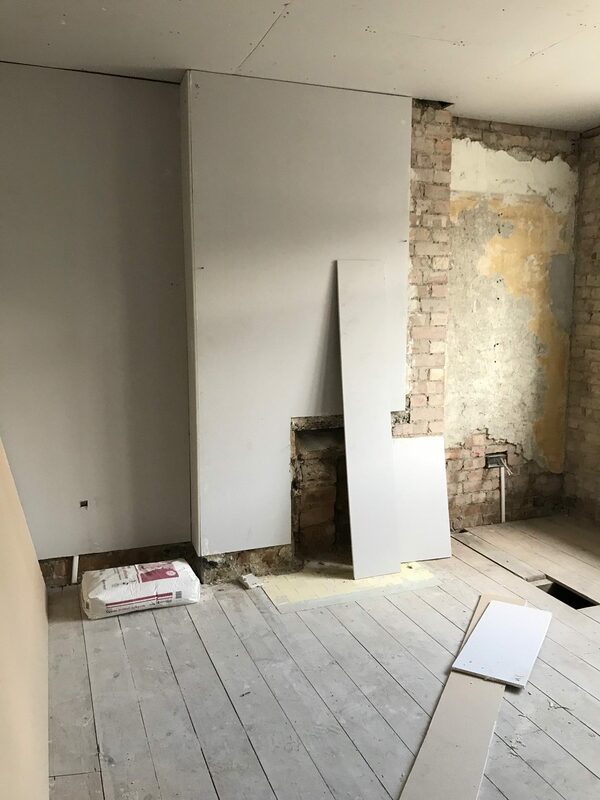 I’ve just moved into a 1910 house and am trying to figure out keeping old walls and patch a few wonky bits or replastering. It’s just so expensive! I’d really appreciate your thoughts. 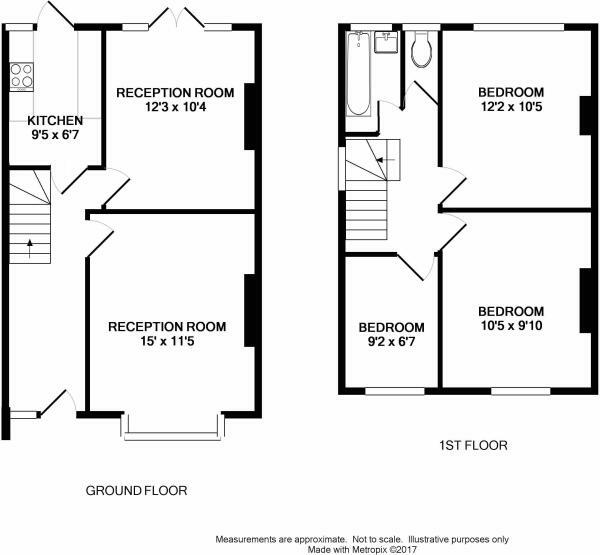 Looks great – we are about to undertake our project and do pretty much the same as you – our floorplans are exactly the same so its great to follow this project! I assume you now have steel beams in place of the missing walls? Oh wow! How cool that we have the same floor plan – hope following along helps you guys a bit in that case. 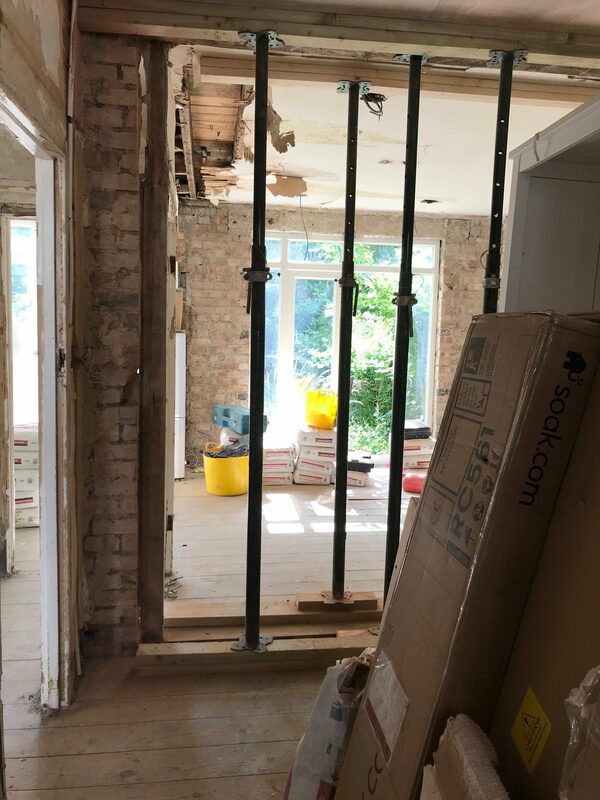 Yes, we have a steel where we took the wall down between the two reception rooms but no steel was needed between the kitchen and back reception as it wasn’t a supporting wall. 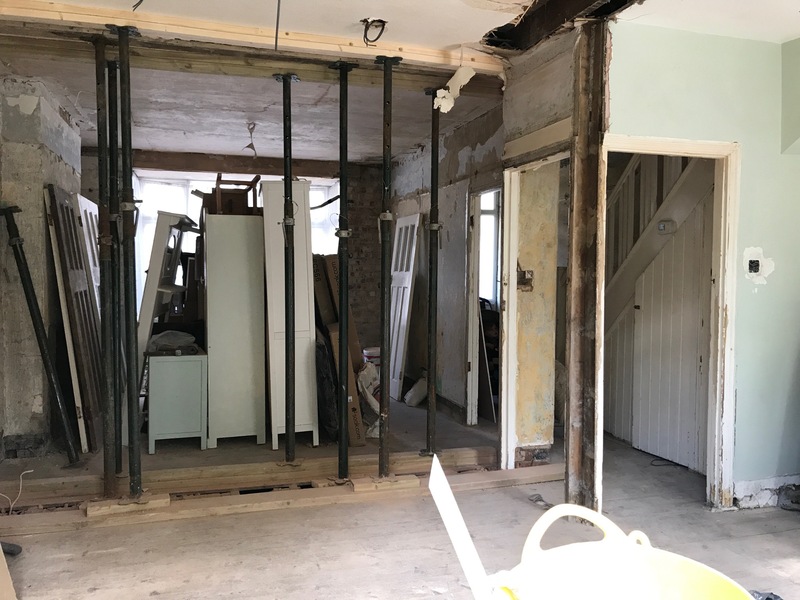 We paid a small team to strip out the house because there had been a large leak and we needed to dry out the walls quickly. It cost just over £1000 for them to remove all the plaster throughout the house and dispose of it. Hope that helps!